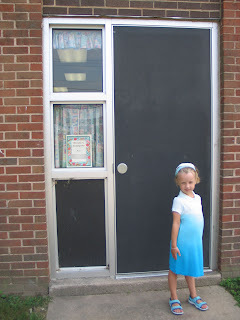 3 Kids, 2 Jobs, 1 Life: Almost a Kindergartener! Well yesterday was the first big day! Open house at Caroline's elementary school! It was an open house for all grades, so the place was packed. I'd be lying if I didn't say how excited I was as we were walking in together. Just seeing all those excited kids and parents there really gave me a lift. And the prospect of this big change for Caroline just had me almost bursting. We quickly found her classroom and did the welcome 'scavenger hunt' where Caroline had to find her name, put it on the board, find her name on her table, and then find her cubby. All very exciting things! She'll have about 15-18 kids in her class (teacher says it changes daily) and I couldn't believe how big the room was. I know the room that my siblings and I had for kindergarten sure wasn't that big! So many different areas for learning and fun. I wanted to take photos but Caroline wasn't exactly into it. It was exciting for me to see 5 computers in the classroom too which is in addition to the HUGE computer lab located in another part of the school. Caroline's teacher, Mrs. R was very nice and I think was already a little impressed by her due to a little association Caroline made between a piece of her clothing and the name of the school. But we left with a feeling of excitement and anticipation for the new school year. I will be very interested to see how she does in the classroom and hear all about her days....if she'll tell me! She'll have gym, music, art, library, and computer time, just like all the big kids. And to top it all off, the playground is right outside her classroom, so I'd be she'll get to go out and play even more than she did in preschool. I also got her school supply list and can't wait to get all the stuff she needs. Kind of funny how all the school supply lists for all the grades include bottles of hand sanitizer - something that we knew nothing about in my days in school. I know a lot of it has to do with H1N1 this year though. (I'm not a big fan of the stuff since I'm not a germophobe, plus I don't like anything with antibacterial properties since I have a strong belief that those types of products are part of the reasons we have things like MRSA. Although the ones that are formulated with rubbing alcohol as the main ingredient are better even though they don't totally kill viruses but just make the surface inhospitable to viruses. No Tricolsan for me please! But I digress.....) So we'll be going out this weekend to buy her various supplies of things like marble composition books (yum! ), glue sticks, tissues, etc. No way am I waiting until the first night of school to go out. This weekend will be busy enough. So suffice it to say, yesterday was a great day and Caroline is getting very excited about starting kindergarten. I don't think she had any preconceived notions going in, so yesterday was really important for her. I loved seeing how excited she was on the way there and after we got home although I think she's already tired of being asked about it, but Jason and I explained that people ask because they care and are excited for her. 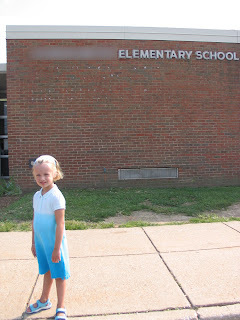 Can't wait for the first day of school shots - we'll see if we get any non-modeling pose ones!